There are a multitude of moments that have defined and shaped my life. Each has transformed me in some small or big way. For every one that I have experienced-both the good and not so good-I feel grateful. It is these moments that create the greatest connection to others and through others, to myself. Isn’t that what we are all longing for in life? To feel connected. To a person or a group of people. To our own greatest ability. To a cause that is bigger than us. To the world we share. 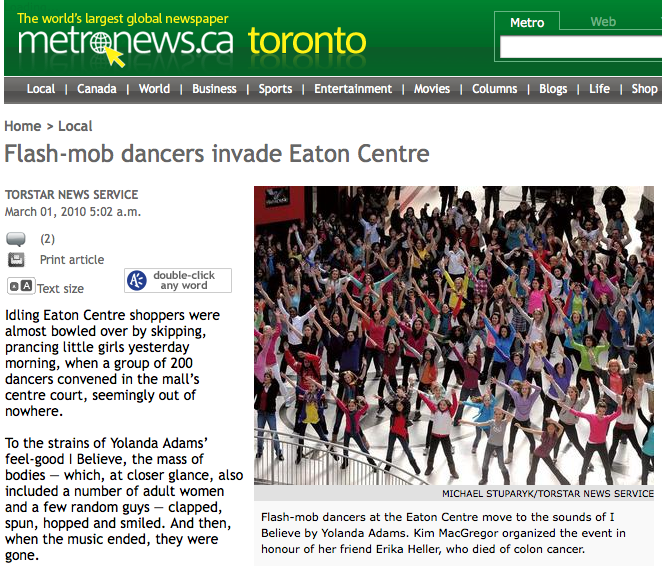 Thanks to over 200 people, mostly strangers, I just experienced another wonderful defining moment, seeing the flash mob come to life. It was bigger and more beautiful than even I envisioned. It is a dream come true, that one single person, my friend Erika, continues to inspire people. Like the little stone tossed in the water that ripples out to touch a million toes standing at the water’s edge of a million different shores-Erika’s spirit is touching so many others and shining a light on all the amazing women we know around the world. It was pure joy to watch my oldest daughter dance down the stairs to join the crowd of smiling dancers all keeping pace with the music. Thank you everyone who participated and all those who have yet to share in this journey. I am grateful to be in the company of such amazing human beings!!! It was a helluva good time and I’m grateful for the opportunity. What a fabulous experience and a treasured memory. they wrote on the newspaper that the event was recorded in order to be seen on you tube, but I can’t find it. Do you have a link so everybody can see how beautiful it was?